Cover Story: Is the FBI Up to the Job 10 Years After 9/11? This story originally appeared in the May 9, 2011, issue of TIME. On May 12, the White House announced that President Obama will seek a two-year extension of Mueller's 10-year term as FBI director, which is set to expire in September. Mueller had already slashed through the red leather briefing book that headquarters dispatched to his Georgetown home before dawn. The title embossed on the cover was simply "Director," above the words "Top Secret/Contains Codeword Material." Yellow highlights flagged the points Mueller wanted to probe. An al-Qaeda affiliate was evading surveillance with a new covert channel of communication. Cyberintruders had breached a defense contractor's firewall. The Tucson, Ariz., shooting of Representative Gabrielle Giffords had become a grotesque recruiting tool for antigovernment extremists. Turmoil in Bahrain had left FBI agents unable to serve a fugitive warrant. Egypt's meltdown was causing trouble for a valuable counterintelligence source. One of three deputy U.S. marshals shot in West Virginia had succumbed to his wounds. Two more federal officers, from Immigration and Customs Enforcement, had been ambushed in northern Mexico, one fatally. Mexican authorities wanted access to FBI files, and Mueller had to decide how much to share. Something more pressing was on Mueller's mind on Feb. 17, when TIME shadowed him through much of his day. The director had locked his sights on Lubbock, Texas, and Spokane, Wash., where his agents were closing in on a pair of unrelated terrorist plots. Mueller stood up abruptly at 7:40, five minutes ahead of schedule, and swept into conference room 7074. His division chiefs had learned by now, some of them the hard way, to assemble early. More analysts beamed in from the National Counterterrorism Center in suburban Virginia, linked by secure video to 61-in. plasma displays on three walls. Said Mueller: "We'll spend 15, 20 minutes going through what happened overnight." As he nears the end of a 10-year term, Mueller, 66, is easily the longest-serving of his peers atop the national-security establishment. His anonymity in the role is almost a parlor trick. He remade the bureau in his image, pushed out the old guard and hired more than half its present cohort. 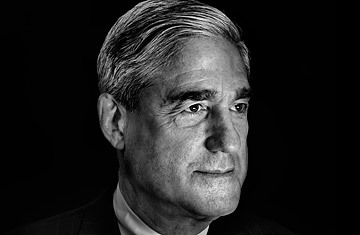 Behind the scenes, he fought historic battles with the White House, twice compelling George W. Bush to change course under threat that Mueller would resign. Yet he is so careful to dodge the spotlight, so rigorously bland when caught onstage, that he could drink unrecognized at any bar in America. It is a revelation to see Mueller in his own domain. There, he is a charismatic figure, level-voiced and seldom profane, who keeps his staff off balance with deadpan remarks that may or may not be jokes. He played ice hockey long past college, until his knees gave out, and he runs operations briefs as a contact sport. "I tend to be impatient," Mueller says. "Sometimes that's good. Sometimes that is not good. A certain degree of impatience is necessary to get decisions made and implemented and to move a group of individuals in a certain way." Mueller inherited 56 field offices, each a distant fiefdom run by a special agent in charge. Old-school SACs (pronounced S-A-C, never sack) measured progress by arrests, kept their files to themselves and lived by the motto "Real agents don't type." They were accountable to no one but the director, and even those chains were loose. Then came the searing failure of Sept. 11, 2001, seven days after Mueller's swearing-in. It was the worst hour in the FBI's 93-year history. "You talk about a learning curve," recalls Art Cummings, who worked alongside him. "He's barely been on the job, hasn't met many of his senior executives" and suddenly is faced with "the 'oh, crap' moments." Field offices in Phoenix and Minneapolis had important clues to the plot long before the attacks. Neither knew what the other knew, and no one put the pieces together. Critics began to say the FBI was irreparably broken, ill equipped to collect intelligence and disinclined to share it anyway. The labor force  heavily white and male, with a blue collar culture that prized physical courage over book smarts  lacked the language and technical skills to adapt. Other agencies took their lumps after 9/11, not least the CIA, but the FBI was on the chopping block when Congress began carving up government agencies. To avoid dismemberment, Mueller made bold promises to cure what ailed the FBI from within  rebuilding it into a modern, intelligence-driven enterprise. His departure in September will mark the end of an era and another big change to an Obama team that will soon see Leon Panetta heading to the Pentagon and General David Petraeus succeeding him at the CIA. Mueller put his money where his mouth was, doubling the agent force on national security and tripling the number of analysts. The FBI built a trip-wire system of early warnings that pre-empted some serious plots. But even a decade's reform has not changed J. Edgar Hoover's gangbusters into a 21st century counterterrorist force. The FBI lumps together in one superagency domestic law-enforcement tasks (such as fighting kidnapping, bank fraud and organized crime) with domestic intelligence roles (such as countering terror and espionage plots). But nearly every U.S. ally  the U.K., for instance, with Scotland Yard and MI5  keeps them separate. It is far from clear that any agency can do a good job at both. "The problem with the FBI is that it has a fundamental institutional culture that does not mesh well with the needs of intelligence," says Judge Richard Posner of the Seventh Circuit Court of Appeals. Police do their work in a world of known crimes and criminals, while an intelligence service must devote years to "looking assiduously and competently for something that may not exist." From TIME's Archives: The Truth About J. Edgar Hoover.